The 2018 Ford Mustang is a car you buy with your heart and spend the next three years saying sorry to your brain for. And your partner, children, neighbours, bank manager, insurance company… it’s a long list so you’d better make sure you’ve earned this. Because here, after all, is almost everything a petrolhead could dream of. Stonking great 5.0-litre V8, stunning silhouette, offensive CO2 emissions (277g/km), and a wickedly anti-social exhaust note. What’s not to love? Just one look at the owners’ reviews shows how the car brings out our inner Clarkson. ‘Lotus Carlton performance in a car so docile your mother could drive it to the shops,’ purrs one. ‘Its engine would make you cry, it’s so beautiful to listen to - and as smooth as a baby’s rear end’ extols another. This is a car that moves people. And Ford wants it to move them straight to the race track. The 2018 car has got fancy gadgets such as line lock (for doing burnouts), launch control (for race starts), acceleration and brake timers - all so you can scrub in a set of slicks and figure out your 0-100-0 times. No, I don’t know what any of it means, either. 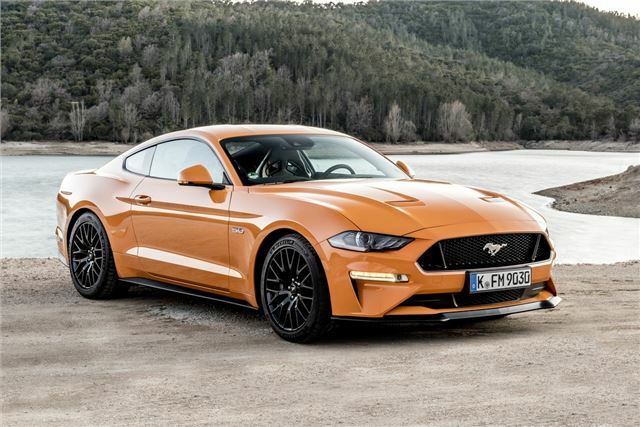 But like the Mustang’s exhaust note it sounds good and it’ll impress/annoy your friends and embarrass your teenage children as you drop them off at school (after they’ve un-origamid themselves from the rear seats). Wait. Did you hear that? It’s the sound of the Pony purists rolling their eyes. Perhaps now’s a good time to remind you that the Mustang got a pathetic two stars in the EuroNCAP safety tests. That makes it the most unsafe car on sale after the 'nul points' Fiat Punto. The Mustang was retested as Ford started rolling out most of this safety kit onto cars currently on sale. At best, you’re looking at a three-star rating. Purists, you can rest assured that the car you’re driving is as unconcerned about pedestrian and occupant safety (both child and adult) as you are. We good? Good. So far, Ford reckons its shifted about 6000 cars in the UK and (33k in Europe), with the majority being the V8. Prices have crept up, though. At launch, you could get into a Mustang (2.3-litre GT) for £28,995. Now, you’ll have to pay £35,995. If you want a V8, you’ll need to spend £41,095. But you do get three extra paint colours to choose from (Orange Fury, Royal Crimson and Kona Blue) and a more premium-feeling interior. Think yawn-inducing soft-touch door linings, aluminium finished door handles, hand-stitched centre console. #ponyfact: The engine-start button pulses at 30bpm – the resting heartrate of a pony. No. We. Are. Not. Making. This. Up. To address criticisms of slightly lacklustre ride and handling, there are some extra exciting shocks available. The fluid has iron particles in it and as the shock needs to work harder, they’re run through a magnetic field to increase resistance. That’s the 'exciting' bit – the 'extra' bit is because they’re optional. About $1600 (or £1600 at today’s exchange rates…). Now would be a good time to tell you how they compare to the existing shocks. Unfortunately, there weren’t any non-MagneRide models available for reference. But they seemed to do a decent job of keeping the car from being a whale in the corners or having the ride of a fully rigid mountain bike (or penny farthing as I believe the originals were called). For such a heavy car, the Mustang stops neatly and with minimal fuss. Initially the Brembo six-piston front callipers were snatchy and grabby. But after some random animals and enthusiastic braking, things improved dramatically. Which is more than we can say for the manual gearbox – it just felt heavy and hard work. Either that or I need to start working out. Luckily, the facelifted Mustang has another new option box to tick - a ten-speed automatic. This a long way from the lazy three-speeders that adorned early Mustangs and is smart enough to recognise the driving conditions and the driving style, which means the next (and correct) cog is only ever milliseconds away. If, like us, you’re lazy and have no muscles, then this is a much easier way of keeping the engine in its sweet spot. And it is a sweet spot. Lower down the rev range, the 450PS V8 is wonderfully lazy. But it’s up around 4600rpm that you get to see what it can really do. Ok, so there are no surprises – it spins its wheels and shakes its tailfeathers. Exactly what you want from a Mustang and worth every penny. Oh, and if you're wondering, it'll do 62mph from standstill in 4.3 seconds and has a 155mph top speed while returning 22.8mpg. After the tyres have spun and the gravel has settled, the Mustang is still true to itself. A stupid great big pony car that moves people to tears and brings them a ridiculous amount of happiness in the way only a car can. If you love Mustangs and you’ve always wanted one, this will undoubtedly be for you. The 2018 Ford Mustang is on sale now.